Chandra X-ray image of the supernovas remnant Cassiopeia A (Cas A). 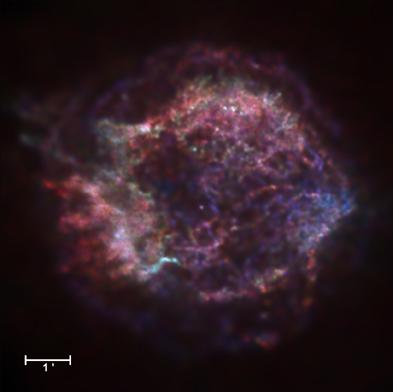 The red, green, and blue regions in this Chandra X-ray image of the supernovas remnant Cassiopeia A show where the intensity of low, medium, and high-energy X-rays, respectively, is greatest. The red material on the left outer edge is enriched in iron, whereas the bright greenish white region on the lower left is enriched in silicon and sulfur. In the blue region on the right edge, low and medium energy X-rays have been filtered out by a cloud of dust and gas in the remnant.